Veritas Radio - Mark McClish - Deception Detection: Do You Know When Someone Is Lying to You? Deception Detection: Do You Know When Someone Is Lying to You? Retired US Marshal with 26 years of federal law enforcement experience, Mark McClish is a specialist in the interview process and gives presentations on 'statement analysis' throughout the US. He has spoken at numerous law enforcement conferences and trained a variety of law enforcement agencies and military organizations to recognize the tell-tale signs of deception. He joined us to discuss deception and how we can protect ourselves from lies and those who tell them. As a training instructor for the U.S. Marshals, he taught courses in how to detect deception while questioning suspects. He indicated that people tend to tell the truth in similar ways, as well as lie in patterns that are repeated and detectable. 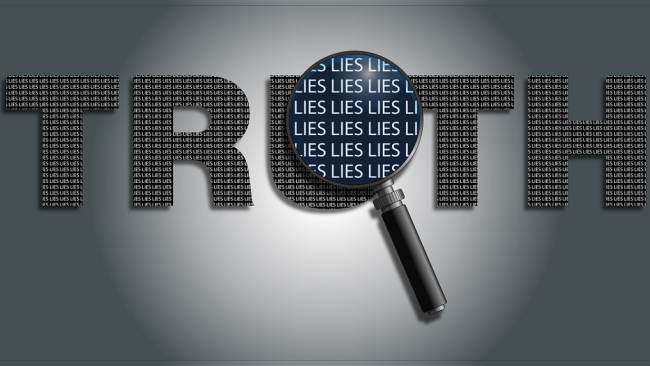 McClish described the psychology of lying with the simple statement that some "are better than others at telling a lie, but people's words will betray them." McClish says that the most common form of deception is lying by omission: what someone tells you is less important than what they do not. For example, people who are innocent will often state explicitly that they did not commit the act they are accused of, while those engaged in deception will simply say "I'm not guilty." McClish said that OJ Simpson "absolutely did it" because he was stumbling in his answers on the stand and in interviews, as well as a written statement that McClish says was not read by his lawyers as it was written, wherein he changed his words to specifically remove himself from having to deny his guilt in any definitive way. McClish discussed his analysis of testimony in other cases such as the Jon Benet Ramsey kidnapping and the accusations against Michael Jackson. Mark McClish was a federal law enforcement officer for 26 years. He started his law enforcement career in 1983 with the U.S. Secret Service Uniformed Division. During the two years he was with the Secret Service he was assigned to the White House. His main duties were protecting the White House complex. He would also on occasion provide protection for President Reagan when the President traveled. In 1985, he was hired by the U.S. Marshals Service and served as a Deputy U.S. Marshal in Springfield, IL. This change allowed him to focus more on investigations and less on protection. He worked numerous federal fugitive cases and assisted local law enforcement in apprehending state fugitives. He also worked on a "Warrant Apprehension Narcotic's Team" which was a national drug task force. In 1990, Mark was promoted to the position of Inspector/Instructor at the U.S. Marshals Service Training Academy located at the Federal Law Enforcement Training Center in Glynco, GA. He taught at the Training Academy for nine years serving as the lead instructor on interviewing techniques. He used this time to study deceptive statements and conduct research on deception. Based on his findings, he created the Statement Analysis techniques for detecting deception in a verbal and written statement. While assigned to the Training Academy Mark was also the lead defensive tactics instructor for the Marshals Service. Mark retired from the Marshals Service in 2009 and started Advanced Interviewing Concepts. His company provides interviewing skills training and assists investigators in analyzing statements.